SecuROM 8 and SecuROM PA DRM, unknown machine limit. A De-Authorization Tool is available. Product keys from all versions can be activated on Origin. 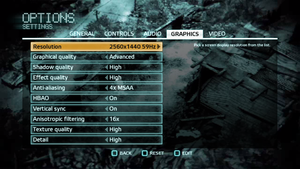 In-game general settings (for multiplayer). 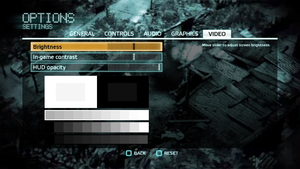 In-game graphics settings (for multiplayer). 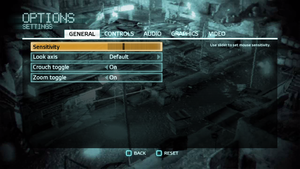 In-game video settings (for multiplayer). 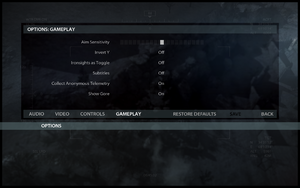 See Lower bloom to fix multiplayer screen flickering. Default singleplayer AF level is 4 samples. See Anisotropic filtering (AF). In game AA doesn't do anything. 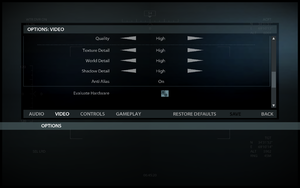 Nvidia users can follow this guide for better AA. 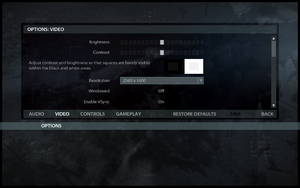 Emulated 4K resolution via DSR provides the best results with the proper video cards and drivers. AMD users can use a combination of GeDoSaTo or VSR along with SMAA/FXAA. 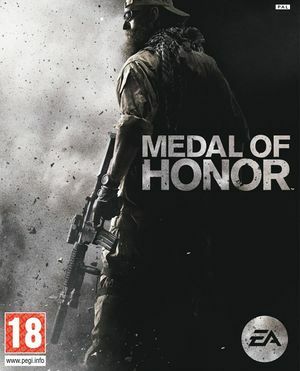 This game uses vertical FOV in multiplayer. See FOV Calculator for help. Change Fov=55 to the desired FOV value. Change MaxAnisotropy=4 to the desired value as necessary. 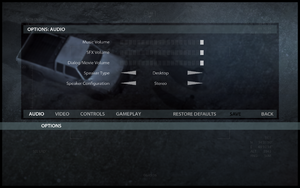 Alternatively you can also override the AF through your GPU's Drivers as well. 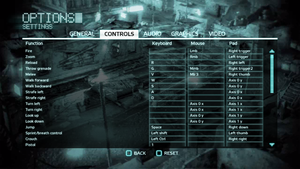 In-game key map settings (for multiplayer). 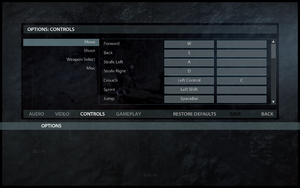 Some menus cannot be navigated via gamepad. Change bEnableMouseSmoothing=true to bEnableMouseSmoothing=false to disable mouse smoothing. Then search for the following commands and change their values to the the following ones. bUseViewAcceleration=False to disable mouse acceleration and bEnableSlowMouseReinterpret=False to remove mouse sensitivity fluctuation during slow mouse moment. Change a line InputAcceleration=1 to InputAcceleration=0. 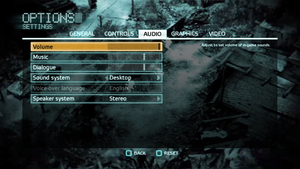 In-game audio settings (for multiplayer). 9, 11 DirectX 9 for single player, DirectX 11 for multiplayer. 3, 5 Shader model 3.0 for single player, Shader model 5.0 for multiplayer. Find all of the posted values and change them to match unless noted by the comment. CSMSizeScale=4.000000 -- WARNING, this massively increases VRAM usage; 3.000000 provides a good balance of quality and performance. ShadowFilterRadius=1.000000 -- Higher values will cause some visual glitches, however this will not. NumStreamedMips=0 -- Add this to the end of every "TEXTUREGROUP" this includes the comma! Do note that the ones below in all CAPS are actually DIFFERENT variables than the ones not in caps. They are specific to this game at the very end of "[SystemSettings]"
XP only supports the single player component, Vista is required for multiplayer. ↑ 1.0 1.1 File/folder structure within this directory reflects the path(s) listed for Windows and/or Steam game data (use Wine regedit to access Windows registry paths). Games with Steam Cloud support may store data in ~/.steam/steam/userdata/<user-id>/47790/ in addition to or instead of this directory. The app ID (47790) may differ in some cases. Treat backslashes as forward slashes. See the glossary page for details. This page was last edited on 15 April 2019, at 20:56.